The Guristas Pirates are never ones to be left behind and the radical ship-design genius of Korako 'The Rabbit' Kosakami was quickly applied to capital ship development as other pirate and outlaw groups rolled out their fleets. 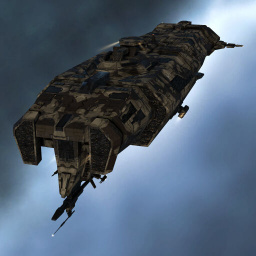 The Caiman is a dreadnought that continues the Guristas emphasis on light strike capability among all their ships. Strong shields, together with powerful cruise missile and torpedo systems, round out a dreadnought that reflects the Rabbit's practice of taking Caldari hulls and twisting them to the preference of the Guristas. Staying true to the Guristas philosophy of combining missiles and drones in combat, the Caiman is unique in that it can command one squadron of light fighters, with the hull bonuses giving this squadron the damage of two, as well as doubling its durability. The Caiman requires the Caldari and Gallente Dreadnought skills to fly. Blueprint copies for this ship can be acquired by destroying Guristas Shipyards in lowsec and nullsec. A large capital fleet is required to accomplish this task. The blueprint itself is stored inside an armored cache that only deep space transports can pick up. Further information about additional or recommended skills to pilot Caiman for a specific or it's common role(s) can be written here. No sub-article about Caiman roles or piloting tactics. You can write them here. You can write additional notes for the Caiman here. This page was last modified on 15 June 2018, at 05:18. This page has been accessed 17,605 times.